Faeries come in all shapes and sizes, with dispositions that cover the spectrum from friendly to malicious. Best known are the dreaded hags nursing their spite and bitterness in seclusion, the magnificent lords and ladies of the hidden kingdoms, and cruel harpies and dreaded sirens who lure people to their dooms, but their ranks also include a raft of lesser beings of wildly varied form and capability. These minor faeries, sometimes called wee folk, might lend aid to mortals, performing chores and easing suffering in exchange for small gifts and favors. Others are as cruel and malicious as the wickedest devil, and take special pleasure in tormenting the hated mortals on the edges of settled lands. Who can know the minds of these immortals and the whys and hows behind what they do? Wee Folk examines an assortment of minor faeries found in the hidden kingdoms and the mortal world to shed light on their strangeness, danger, and unpredictability. 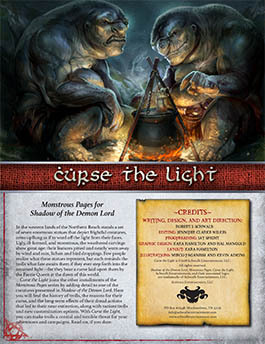 This supplement also revisits several faeries described in Shadow and other sourcebooks. 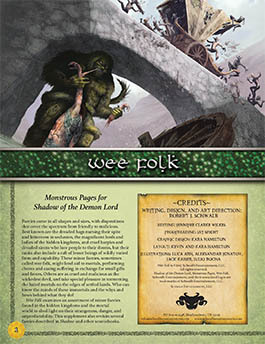 Buy Wee Folk from Schwalb Entertainment or DriveThruRPG today! Unthinking and uncaring, giants are more forces of nature than villains. Birthed long ago in the time of the Troll King, the consensus among the learned is that giants were enslaved, bred, created, or otherwise spawned to serve as war machines during the Troll Wars. Untouched by the degradations of their former masters, they trudge on, indulging in their base desires. In this installment of Monstrous Pages, Forces of Nature examines giants in all their menace. 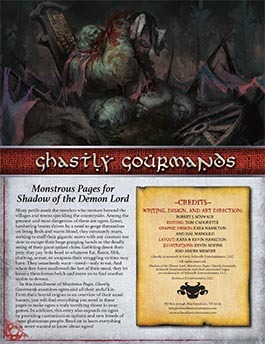 From their uncertain origins to an overview of their strange beliefs and behaviors, in these pages you will find everything you need to let loose these brutes to stomp across your campaign. This entry also expands on giants by providing customization options and abhorrent new breeds. Read on and create nasty, brutish, and gigantic encounters your players will soon not forget. 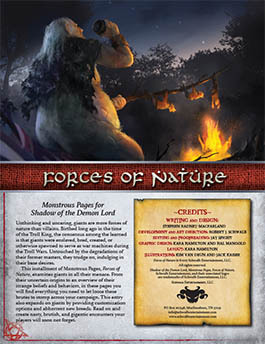 Buy the Forces of Nature PDF today from Schwalb Entertainment or DriveThruRPG! Foulest Reptiles reveals the secrets of the lizardmen, a degenerate race of reptilian humanoids that live on the edges of settled lands, and lays bare the true origins of these cruel and vicious people. 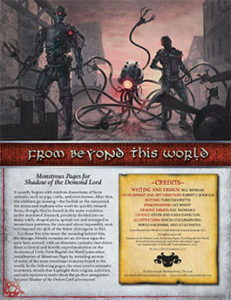 Like other installments of the Monstrous Pages series, this supplement offers extensive lore about the creatures and expands on their abilities to provide you with even more customization options and variants. 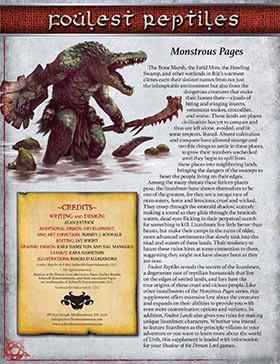 In addition, Foulest Reptiles gives you rules for making unique lizardmen characters. 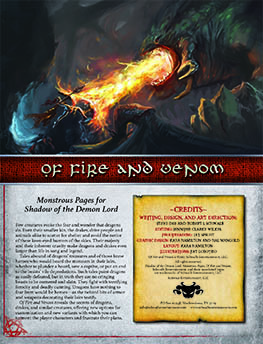 Whether you intend to feature lizardmen as the principle villains in your adventure or you want to learn more about the world of Urth, this supplement is loaded with information for your Shadow of the Demon Lord games. Buy Foulest Reptiles as a PDF from Schwalb Entertainment or DriveThruRPG! The misbegotten hybrids of strange unions, the results of bizarre conjurations, creatures warped through experimentation, alchemical effluvia, or the corrupting taint of the Void, monsters are often unique beings. Few monsters are members of entirely new species though some species have their origins in such beasts. Usually prone to fits of violent rage, monsters are driven by hunger, brutal instinct, and all-too-commonly pain wrought by their unnatural creation or existence. Whether found in the forsaken wilds, hidden laboratories, or areas polluted by alchemical toxins, most are thankfully solitary. Only in rare instances are several identical monsters created, those capable of fighting as a pack most likely to cooperate with each other. 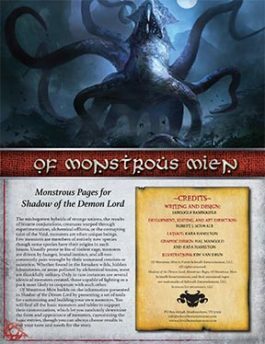 Of Monstrous Mien builds on the information presented in Shadow of the Demon Lord by presenting a set of tools for customizing and building your own monsters. You will find all the basic monsters and tables to support their customization, which let you randomly determine the form and appearance of monsters, customizing the basic entries, though you can always choose results to suit your taste and needs for the story. 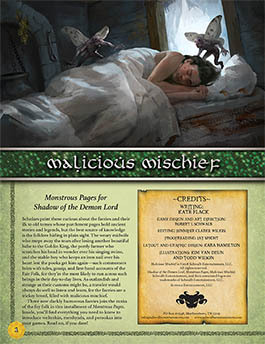 Buy Of Monstrous Mien in PDF from Schwalb Entertainment or DriveThruRPG! Get Ready for Horrific Parasites! Lurking in dark alleyways or hiding in plain sight on bustling streets, the enigmatic and damned creatures known as harvesters stalk and murder the innocent to fulfill peculiar needs. Named for their acts of killing and surgically removing organs, bones, and skin from their victims, harvesters have been horrific parasites on civilization for millennia. Harvester bodies are literal patchworks of organs, limbs, and bones, none of which are their original parts. When an organ begins to fail, a harvester removes the damaged, diseased, or aged one, replacing it with one from a healthy “donor.” This grotesque practice grants them near immortality as they do not appear to age in any traditional sense—some harvesters are hundreds, even a thousand, years old—dying off only when they are caught and killed or when they are unable to replace a critical, failed organ. Because harvesters never venture away from cities and towns, there is always ready supply of fresh organs from the unwitting populace. This entry in the Monstrous Pages series examines the harvesters and lays bare their secrets, revealing their origins, practices, and place in the lands of Rûl. Using the lore and rules in Horrific Parasites helps you make harvesters even more dangerous and terrifying! 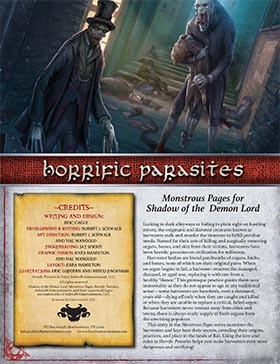 Buy Horrific Parasites from Schwalb Entertainment or on DriveThruRPG!